Nature has been unkind to Tahir Khan and his family twice in five years. First, it was the October 2005 earthquake that mauled large parts of northern Pakistan, including their district of Shangla. Then came the floods this summer, washing away whatever recovery they had made in the past five years. Tahir Khan breaks into tears while narrating his string of misfortunes. "We had always lived in an extended family - the wives, sons and daughters of my father and his four brothers, and the wives and children of their children," he says. "We were a 45-member family living in a 25-room compound down by the river, with a sprawling orchard, a trout hatchery and our own hydroelectric-power generator." The earthquake destroyed 10 rooms of the compound and damaged several others. The family had to move temporarily to rented accommodation in the town of Mingora, in the neighbouring Swat district. "It took us two years to make our place liveable again, but some parts could not be restored so the family had to split," he says. 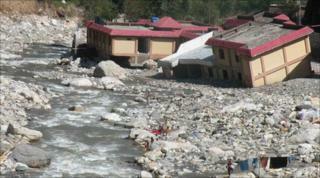 The floods last August have again washed away large parts of the house, displacing and further splitting up the family. And the tragedy is not confined to individual suffering alone. The earthquake caused landslides to block Shangla's deep and narrow valleys, destroying its roads and other infrastructure and killing hundreds of people. The Earthquake Reconstruction and Rehabilitation Authority (Erra), formed to channel the massive international aid Pakistan received following the disaster, poured hundreds of millions of dollars into more than 700 projects in Shangla. Much of the effort it made to rehabilitate local people has now been wiped out by the floods. One economically crucial project was the Alpurai-Besham road, which cut through the district and provided the shortest route for goods transported from the Chinese border to the Peshawar valley region in Khyber Pakhtunkhwa province. After parts of it were destroyed in the earthquake, the government decided to upgrade it to a national highway and allocated large funds for its reconstruction. Mountainsides were cut to widen the 30km (18-mile) road, and large patches were fully restored. During the government's major offensive against militants in the Swat valley in 2009, the road served as the main supply route for the army. It was to be competed in November 2010, but that was not to be. Today, it presents a pathetic sight. Torrential rains in July washed down large quantities of mud and rock onto the road, and a surge in the river below washed away its foundations in many places. What was close to becoming a broad, two-lane highway is now little more than a bumpy jeep track, in places perching precariously above a noisy mountain stream. Some 15km (9 miles) down the road from Shangla's administrative centre, Alpurai, what was once a beautifully built two-storey hospital building now leans precariously over the riverbed, like a trailer that has lost wheels on one side. After the hospital at the town of Karora was destroyed by the earthquake, Erra spent $590,000 rebuilding it. But the floods in July washed away its foundations and the building sank to one side - yet it did not break apart. "They had designed the structure to resist earthquakes, but God sent the floods," says Qutb-e-Alam, a senior official at the hospital. Mr Alam was posted to this hospital in August 2005, about two months before the earthquake. As such, he has seen the place destroyed twice. "The floods washed through the entire building, destroying everything - the laboratory equipment, the X-ray plant, ultrasound equipment, the operating theatre, computers and the furniture," he adds. In a remote district like Shangla, there are few medical facilities that are as well equipped as this one was. "This was a 24-bed hospital, and was located at a central spot. On an average, we handled between 100 to 150 patients a day. People in need of treatment must now travel to Mingora or Peshawar," he says. Inside the district government's offices in Alpurai, officials are still counting the losses. At least 160 people died during the floods in Shangla, hundreds of houses were washed away, scores of kilometres of roads were destroyed, and dozens of school buildings and clinics were rendered useless. For Mohammad Ayaz, the head of administration, it has been a tough time. "We had achieved a lot following the earthquake, making good use of the money that had poured into the country. Now we are back to square one," he says. The nearby offices of Erra appear deserted. The agency's funds were already drying up before the floods, even though they had completed barely half of the earthquake rehabilitation work they were supposed to do. It has now trimmed its staff; those who remain are preparing to pack up. Meanwhile, the challenge ahead is more daunting than before. "It was easier after the earthquake," says Tahir Khan. "We had lost just the buildings. This time, everything is gone - the buildings, the fixtures, the generators, the roads and the land on which it was all built."